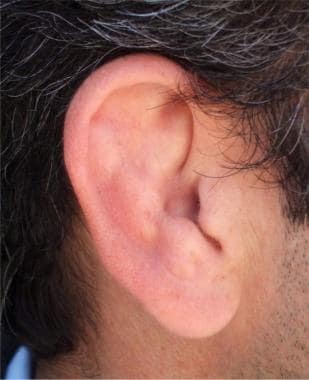 Auricular hematoma, shown below, is a complication that results from direct trauma to the anterior auricle and is a common facial injury in wrestlers. [1, 2, 3] Shearing forces to the anterior auricle can lead to separation of the anterior auricular perichondrium from the underlying, tightly adherent cartilage. This may lead to tearing of the perichondrial blood vessels and subsequent hematoma formation. The auricle and external acoustic meatus (or external auditory canal) compose the external ear. The external ear functions to collect and amplify sound, which then gets transmitted to the middle ear. The asymmetric shape of the external auricle introduces delays in the path of sound that assist in sound localization. The arterial supply of the auricle is composed of the posterior auricular artery, the anterior auricular branch of the superficial temporal artery, and the occipital artery, which also contributes. Veins accompany the corresponding named arteries. Local anesthesia with lidocaine 1% with or without epinephrine can be infiltrated directly into the area to be incised. Many authors advocate the use of the lidocaine without the presence of a vasoconstrictive agent such as epinephrine. However, some literature supports the safety of vasoconstrictive agents in areas such as the nose or pinna. 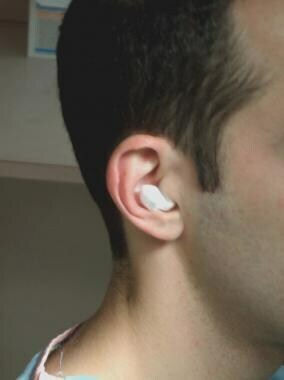 Alternatively, an auricular block can be performed. For more information, see Ear Anesthesia. 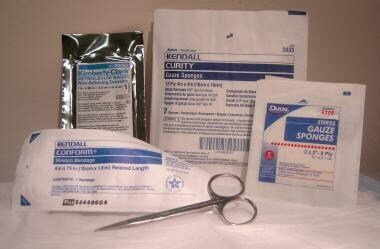 Supplies needed to make a simple compression dressing. Place patient in the lateral decubitus position on the unaffected side. Cleanse the skin with povidone iodine, ChloraPrep (chlorhexidine gluconate 2% and isopropyl alcohol 70%), or another cleanser. Although still widely used, this method is no longer recommended by many sources because of hematoma reaccumulation. The aspiration is often inadequate and the hematoma requires additional management. Some sources recommend primary needle aspiration followed by the incision method, if reaccumulation occurs. Use an 18- or 20-ga needle to aspirate blood from the most fluctuant or full area. Incise the edge of hematoma along the natural skin folds using a No. 15 scalpel. A small (5 mm) incision is often all that is necessary. Gently separate the skin and perichondrium from the hematoma and cartilage and completely express or suction out the hematoma, as shown below. Be careful not to damage the perichondrium. Auricular hematoma incision and drainage. Irrigate the pocket with normal saline with an 18-ga angiocatheter. Optional step: Leave a small drain in the incision. This allows the wound to drain but also predisposes to infection. If a drain is placed, the patient should always be given antibiotics upon discharge. The drain should be removed in 24 hours if no significant bleeding occurs. Reapproximate the perichondrium to the cartilage. Apply digital pressure for 5-10 minutes, and then apply compression dressing. A simple dressing is inadequate, as the hematoma is likely to reaccumulate. Compression dressing can be applied noninvasively (more applicable in the ED) or surgically. Noninvasive methods include a simple compression dressing or, if available, application of silicone splints or plaster mold to the medial and lateral aspects of the auricle, as shown below. Surgical dressing involves securing cotton bolsters, buttons, or thermoplastic splints  with through and through sutures to the medial and lateral aspects of the auricle. Place dry cotton into the external canal, as shown below. Compression dressing: Dry cotton in external canal. 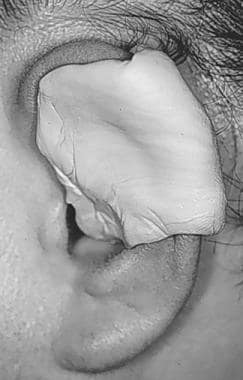 Fill all external auricular crevices with either moist gauze (soaked in saline) or Vaseline gauze, as depicted in the image below. Compression dressing: Vaseline gauze in anterior pinna. 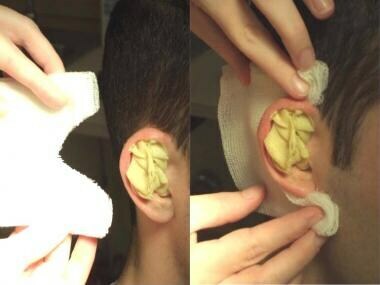 Place 3-4 layers of gauze behind the ear as a posterior gauze pack. 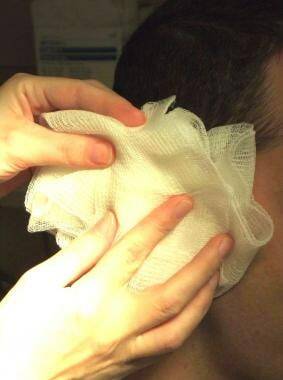 Prior to placement, cut out a V-shaped section of gauze so that the gauze fits snugly behind the ear, as shown below. Compression dressing: Gauze behind pinna. 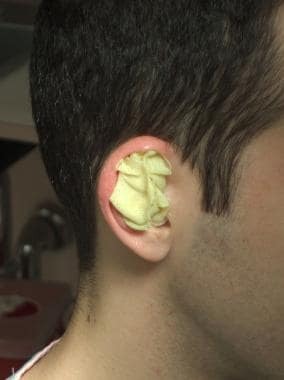 Cover the packed anterior ear as shown below, with multiple layers of fluffed gauze. 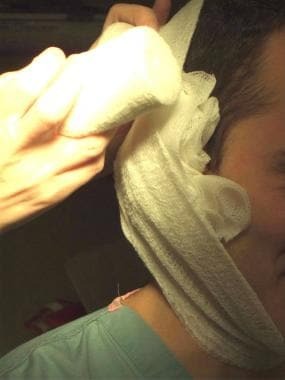 Compression dressing: Gauze applied to anterior ear. Bandage the fluffed gauze into place with Kling or an elastic bandage, as shown in the image below. Compression dressing: Bandaging dressing into place. Specialized compression dressings, such as a silicone splint or dental rolls sewn onto the anterior and posterior pinna, can also be made, though such dressings are normally prepared and applied by a specialist. The ear must be reexamined for hematoma reoccurrence every 24 hours for several days. Aspirin, nonsteroidal anti-inflammatory drugs (NSAIDs), or anticoagulants should be discontinued or avoided for several days to prevent continuing bleeding. Recommendations indicate that, upon discharge, patients should receive antibiotics that cover common skin flora for 7-10 days. Patients whose immune systems are compromised should receive antibiotic prophylaxis covering both Staphylococcus and Pseudomonas species. If infections suspicious for Pseudomonas species are discovered during follow-up, the patient should be admitted to the hospital for open drainage and intravenous antibiotics. Do not leave an auricular hematoma undrained unless the injury is older than 7 days. Apply a compression dressing rather than a simple dressing. Perform daily follow-up ear examinations. What is the goal of auricular hematoma treatment? What is the anatomy of the external ear relevant to auricular hematoma? What are indications for auricular hematoma drainage? What are contraindication for auricular hematoma drainage? What is the role of anesthesia in auricular hematoma drainage? What equipment is needed to perform auricular hematoma drainage? 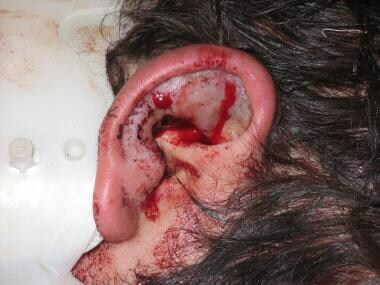 How is the patient positioned for auricular hematoma drainage? How are patients prepped for auricular hematoma drainage? What is the role of needle aspiration in auricular hematoma drainage? How are incision and drainage of auricular hematoma performed? What are the procedures for compression dressing following auricular hematoma drainage? What are procedures for surgical dressing following auricular hematoma drainage? What is included in postoperative care of auricular hematoma drainage? What are clinical pearls for auricular hematoma drainage? What are the possible complications of auricular hematoma drainage? Giffin CS. Wrestler's ear: pathophysiology and treatment. Ann Plast Surg. 1992 Feb. 28(2):131-9. [Medline]. Schuller DE, Dankle SD, Strauss RH. A technique to treat wrestlers' auricular hematoma without interrupting training or competition. Arch Otolaryngol Head Neck Surg. 1989 Feb. 115(2):202-6. [Medline]. Mudry A, Pirsig W. Auricular hematoma and cauliflower deformation of the ear: from art to medicine. Otol Neurotol. 2009 Jan. 30(1):116-20. [Medline]. Roy S, Smith LP. A novel technique for treating auricular hematomas in mixed martial artists (ultimate fighters). Am J Otolaryngol. 2010 Jan-Feb. 31(1):21-4. [Medline]. Greywoode JD, Pribitkin EA, Krein H. Management of auricular hematoma and the cauliflower ear. Facial Plast Surg. 2010 Dec. 26(6):451-5. [Medline]. Ghanem T, Rasamny JK, Park SS. Rethinking auricular trauma. Laryngoscope. 2005 Jul. 115(7):1251-5. [Medline]. Henderson JM, Salama AR, Blanchaert RH Jr. Management of auricular hematoma using a thermoplastic splint. Arch Otolaryngol Head Neck Surg. 2000 Jul. 126(7):888-90. [Medline]. Bailey B, Calhoun K. Atlas of Head and Neck Surgery - Otolaryngology. 2nd ed. Philadelphia, Pa: Lippincott Williams & Wilkins; 2001. 456-7. Davidson, TM. Ambulatory Healthcare Pathways for Ear, Nose, and Throat Disordershttp://drdavidson.ucsd.edu/Portals/0/Ambuindex.htm. UCSD Otolaryngology - Head & Neck Surgery. Available at http://drdavidson.ucsd.edu/. Accessed: July 28, 2006. Kelly TF, Suby JS. Wrestling. Mellon MB. Team Physician's Handbook. 3rd ed. Philadelphia, Pa: Hanley & Belfus; 2002. 614-28. Lalwani A. Diseases of External Ear. Current Diagnosis & Treatment in Otolaryngology-Head & Neck Surgery. Philadelphia, Pa: McGraw-Hill; 2004. Lane SE, Rhame GL, Wroble RL. A silicone splint for auricular hematoma. The Physician and Sports Medicine. 1998. 26(9):77. Roberts JR, Hedges J, eds. Clinical Procedures in Emergency Medicine. 4th ed. Philadelphia, Pa: WB Saunders; 2003. 1299-1300. Tintinalli JE, Kelen GD, Stapczynski JS, eds. Emergency Medicine: A Comprehensive Study Guide. 6th ed. New York, NY: McGraw-Hill; 2004. 1470. The authors and editors of Medscape Reference gratefully acknowledge the contributions of previous authors Moira Davenport, MD, Christopher McStay, MD, Beno Oppenheimer, MD, and Linda Regan, MD, to the development and writing of this article.